Auto-Trail’s play for a slice of the entry-level coachbuilt motorhome market surprised many followers of the marque – not least because Tribute coachbuilts already occupy this space and are built in the same factory. But raised eyebrows were soon lowered and all doubts put aside when Imala was seen in the metal. Lighter in weight and more affordable than other Auto-Trail models, the new Imala line-up targeted younger customers, who lack C1 entitlement on their driving licences, and has been very well received. So much so that the range has expanded for 2016 and, if confirmation were needed that the Imala range has come of age, then the island-bed Imala 730 provides that proof. The Imala range looks good, since it takes design cues from its premium siblings. Metallic-graphite cabs are paired with brilliant white bodyshells and linked by red and grey stripes. The pronounced overcab moulding is classic Auto-Trail style, with the brand name stretching across in silver. Inside the Imala 730, mid-toned cabinetwork combines well with the oatmeal-coloured seating; red accents are added by curtain tie- backs and scatter cushions. This pleasing ‘Iris’ ensemble, as with much here, doesn’t shout ‘entry-level’. Habitation construction features 40mm-thick laminated walls, 45mm-thick laminated floors, and a 40mm part-laminated roof. The chassis and conversion carry a five-year warranty, the bodyshell a 10-year guarantee (terms and conditions apply). Two body styles are available at the same price: a low-line with overcab storage and panoramic skylight, as tested here, and a high-line with overcab double bed, and panoramic skylight. Based on the Fiat Ducato, with the 130bhp 2.3-litre turbodiesel engine, the Auto-Trail Imala 730 has a car-like cab and a commanding driving position; little sound emanates from behind the driver when the stereo is turned off. Standard base vehicle specification includes Electronic Stability Control with hill hold, Traction Plus control with hill descent, cruise control and a spare wheel. With the parallel lounge layout as tested, the Imala 730 has two travel seats. You can specify a half-dinette as an £825 cost option, which adds two seatbelts (this requires a chassis up-plating to 3650kg). The Auto-Trail Imala 730's parallel lounge is a sociable space with a pleasing atmosphere, thanks to daylight that enters from both side windows and the cab skylight. The lounge seating is comfortable, and a folding-leaf table can be added for meals. Over-locker lighting and cassette blinds offer a touch of class. Thanks to a retractable fixed bed that requires a smaller share of the space in this 7.25m-long 'van, the Auto-Trail Imala 730 has an impressive galley. The worktop is generous and, with the cooker lid lowered and the sink infill, there’s plenty of space for food preparation. A dual-fuel hob atop the separate oven and grill, a 96-litre, dual-fuel fridge with separate freezer, and a microwave oven round out the kitchen. Five task lights and under-locker LEDs illuminate the kitchen after dark. Towards the rear, the island bed affords two positions: push it towards the headboard so there’s space to move around; pull the bed flat at night. When raised, the headboard can be left in situ in the evenings, for watching TV or reading. Illumination options include windows, a rooflight and ambient LED lighting. The lounge can be converted into a second double bed, by pulling the sliding seat frame into the gangway and rearranging the cushions. A sliding partition screens the master bedroom from the lounge. The island bed measures 1.86m x 1.34m (6ft 1in x 4ft 4in), while the dinette bed measures 2.17m x 1.22m (7ft 1in x 4ft). The nearside washroom’s central location will serve the occupants of both double beds. It has a swivel-seat cassette toilet, an oval basin above a cupboard and a window you can open to clear the steam. To the left as you enter is a half-length mirror and a well-sealed separate shower cubicle is located to the right. Nine overhead lockers, two wardrobes and cupboards comprise the 730's storage options, in addition to the under-bed space, which is accessible from an exterior hatch on the rear wall. A payload of 330kg should cover the kit needs of most touring couples; if not, C1 licence holders can up-plate to 3650kg free of charge. The Auto-Trail Imala 730's standard specification offers dual-fuel Truma heating, high-quality drop-in carpets and LED lighting. Cost options include alternative soft-furnishing schemes (including leather), a towbar and electrics, a 100W solar panel and an uprated engine. For £649, the Auto-Trail Media Pack adds an analogue radio and CD player with Bluetooth and USB connectivity for mobile devices, an 18.5in flatscreen TV, an aerial, and a reversing camera. 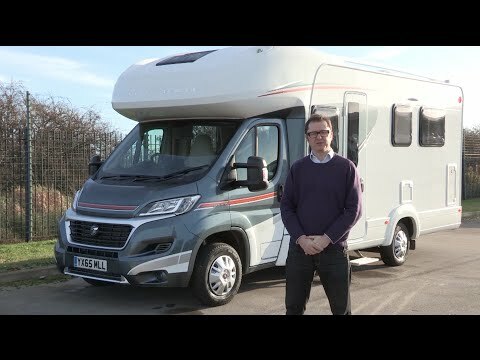 If you buy an Imala 730 you will get access to Auto-Trail desirability at a lower price, but in a range that doesn’t feel downmarket. On top of that, the Auto-Trail Imala 730 brings the convenience and comfort of a well-executed island-bed layout to the party, and that in itself will be a deal-maker for many buyers. And to see other Auto-Trail motorhomes for sale, click here.